Henry Linklater Scholarship — established in 2016. Henry Cook Award — established in 2018. James Spence Award — established in 2018. Robert ‘Snowshoe’ Parenteau Award — established in 2018. 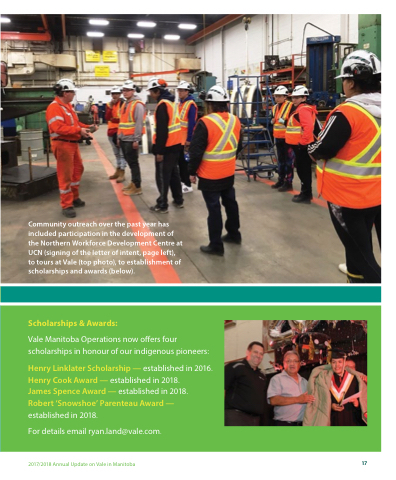 Community outreach over the past year has included participation in the development of the Northern Workforce Development Centre at UCN (signing of the letter of intent, page left), to tours at Vale (top photo), to establishment of scholarships and awards (below).